Our best advice is to hold off on studying for the exam until your application has been accepted by INCOSE. Over the years, we have noticed many students misunderstand the amount of time it takes to fill out an application. INCOSE estimates that it will take 20 hours to complete the paperwork. It's also very important to remember that you cannot take the exam until INCOSE accepts your application. Therefore, Step 1 is to concentrate on filling out the CSEP Application correctly. It should be noted that the ASEP Application is considerably easier, because you don't need to document any experience or provide references. But you still may want to go through the Webinar in order to understand what you'll need for the CSEP Application in the future. Our webinar provides an extensive overview of the INCOSE organization, the certification process, and tips on filling out a proper and effective CSEP application. We ask that you sign-up in order to gain access to the Webinar class website within Canvas. The video of our last webinar, slides and even more helpful material will be available to you there. This also gives you a chance to see what tools we use to deliver our on-line course -- our conferencing software for the lectures and our on-line classroom within Canvas for the material. This really gives you a real “try before you buy” experience. What is the INCOSE Certification Process? Sample Quiz - I provide a sample Quiz from my INCOSE SEP Exam Preparation Course. Also a copy of a study guide of all 31 processes in the handbook. Exam Testimonials -- Several previous students have written about their experience in taking the exam. 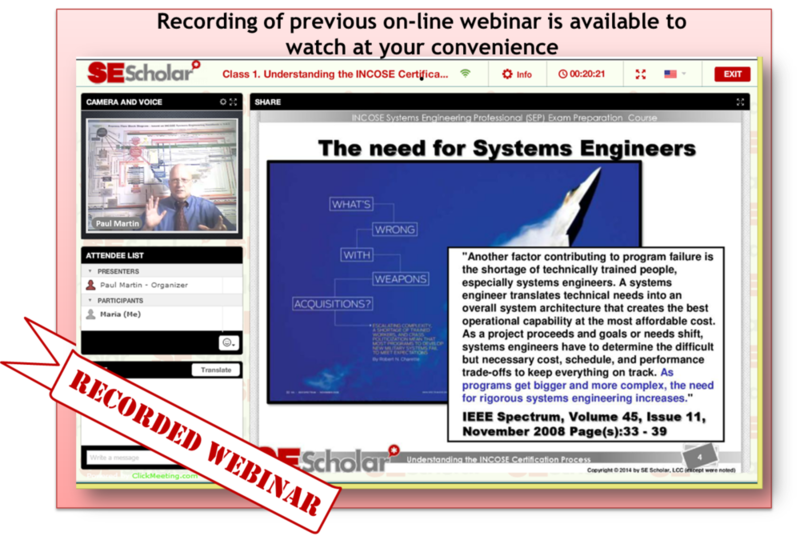 We just finished our FREE webinar on “Understanding the INCOSE Certification Process” We'll send you instructions on how to access our free material, including a link to a video of our last Webinar. Would you like notifications of Upcoming Courses? Thanks for signing up for our Free Webinar. In the next few days, we’ll be placing your name and e-mail address into our Learning Management System from Instructure Canvas. Please be on the look-out for an e-mail from them with the subject line Course Invitation. ‏ (Be sure to check your Junk folder just in case the e-mail gets re-routed inadvertently.) ‏ Follow the link provided in the e-mail to view the Free Webinar page. Accept the invitation and register for an account with Canvas. More information can be found at our Student Sign In page.